Hi, Readers, now that graduation is past, and I’m still standing - just about - I have some advice for you. This is something my Aunt Wisdom says to me when she gives me something nice, like a bracelet my great grandmother gave to my grandmother and she gave to my mother when she graduated from high school. It means use your nice things, don’t just save them. 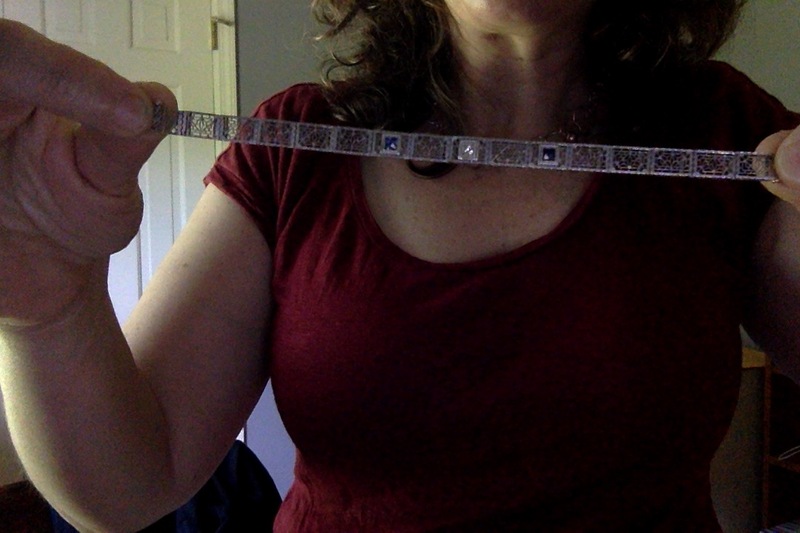 I immediately put the bracelet into my jewelry box for a special occasion, contrary to Aunt Wisdom’s advice. It’s hard not to pickle things, I find. When I buy a new item, I resist wearing it right away. I’m waiting for the perfect occasion. Although I get Aunt Wisdom’s drift: use it, enjoy it, don’t save it for some perfect moment. We don’t have that many moments as it is, so we might as well enjoy them while wearing the platinum filigree bracelet studded with sapphires. Anyway, “Don’t pickle it” is something my Aunt Wisdom says. She says her mother said it to her, which means that, technically, the saying comes from my grandmother, Baba, although Baba never said it to me. Precision, precision in all things. It’s because I’m a lawyer’s daughter and a former potential librarian. I’m a stickler for giving proper credit. That’s because I never felt like I got credit for anything. Or maybe because my parents would interrogate me when I came up with a declarative opinion. “Where’d you get that information?” one or another of them would say. As if to suggest I couldn’t have come up with that information on my own. But did I want to go dark just now? No, I wanted to talk about Don’t Pickle It as a rule for successful living. The word “successful” here means “pleasant” or “comfortable”, which I think is fair, if a stretch. What else is this blog about if not about stretching the definition of success so that it encompasses just about everything? So, yes, I’m thinking of Don’t Pickle It and success, because just the other week, I went to an Event for the husband. For this Event, I pulled out some evening sandals that I’ve had for a long time. Eighteen years, precisely. Precision, precision. 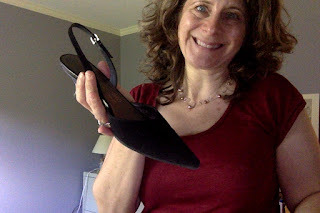 I bought them when I was pregnant with the 17-year-old to wear to a wedding in which I was a bridesmaid. An eight months’ pregnant bridesmaid, if you must know. Indeed, the last time I wore them was when I was pregnant with the 17-year-old and a bridesmaid. The sandals have traveled from Boston to Albany to New York City and back to Albany in the meantime. They have definitely been pickled. Now they have come back into fashion, sandals with a blocky heel. So I pulled ‘em out and put them on. Finally, the moment was right. This Event was that moment. And when I returned home and pulled the sandals off, much of the lining of the sandals’ straps and inner soles remained attached to my feet in a tarry substance, sort of like painted on sandals, if the paint were tar, and requiring much scrubbing to remove. And the shoes had to go buh-bye. Lesson learned. With that experience still fresh, I permitted myself to wear my very nice slingback shoes to the 8th grader’s moving up ceremony, instead of saving them for just the right occasion. And I was glad I did. Even though I was sitting on an uncomfortable bleacher in a high school gym while four hundred 8th graders processed and received diplomas, I was glad I was wearing the nice Ferragamos I bought for my sister the psychoanalyst’s wedding 13 years ago. My feet, at least, were as nicely dressed as some of the boys, who were in blazers and bowties, and I felt festive. Expensive upfront, but cost per wear over time makes up for it. *Cat Stevens's song "Oh Very Young." It's about love, not things. But whatever. Thank you - aren't they divine! I know the kitten heel is controversial. Is it frumpy or fashionable? I choose the latter! Thanks for writing.